EconomicPolicyJournal.com: Why Do So Many Affordable-Housing Advocates Reject the Law of Supply and Demand? all new housing, market-rate as well as subsidized, helps to keep housing prices under control. 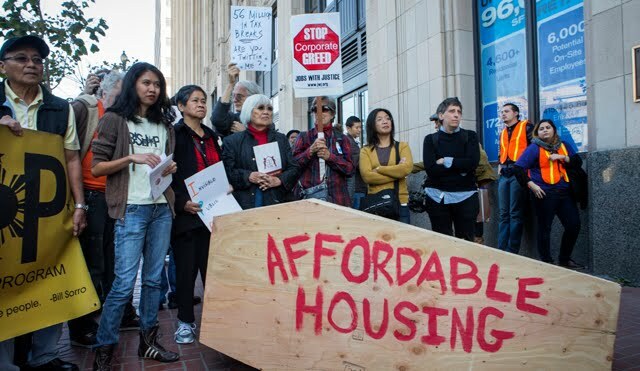 The main reason affordable housing market advocates, and those who support them, disregard supply and demand is that affordable housing is politically too valuable. Solving the housing issue by letting the free market work would not only pull a major political plank out from under liberals, it would be visible evidence that free markets, not the STATE, works. Check the comments to this article at the Washington Compost. Not pretty to those in favor of free markets, private property and freedom in general. I shouldn't have done it, but I couldn't stay away. Something about the comments fascinates me. It's not so much that they deny the law of supply and demand, but rather that they (almost to a man) posit some extenuating circumstances which, they claim, will hamper its operation (e.g. "there's a physical limit to urban space" or "more rich people would just move in.") IMO it's ridiculous to claim to even have this degree of hypothetical knowledge of a complex system, and also ridiculous to assert that these factors are sufficiently influential to overcome Econ 101, but they seem to have convinced themselves of it. This seems to be an inherent problem with the economic argument. It's fundamentally utilitarian and general. It invariably leaves some weasel room for someone to declare "well these are special circumstances because yadda yadda yadda." Personally, I view the moral argument as vastly superior. These people, for all their supposed good intentions, are ultimately saying "it's OK to grab someone and throw them into a cage if they charge what some 3rd party believes to be the 'wrong' price to rent their own property." To me, this is the crux of the issue, and the whole economic argument is mostly just besides the point. When clear-thinking economists talk about the Law of Supply and Demand, they experience the discussion as a search for something true about reality and as non-negotiable as gravity. When confused interventionists talk about Supply and Demand, they experience it as a proposition for how society should be arranged. To them economics is a discussion about how best to arrange the rules of the game, not an attempt to discover the rules that already exist and cannot be avoided. The one's who have really thought through their confusion think all our economics is some sort of clever trick to distract them when we really could just arrange society however we'd like if we weren't such jerks.